The baseball gods will probably smite the Yankees for this, but at the moment, the Yankees have too many Major League caliber players. They can’t fit them all on the 25-man big league roster. Brandon Drury is in Triple-A, and, when Greg Bird returns in the coming days, Tyler Austin may have to go to Scranton too. Tommy Kahnle’s and Adam Warren’s return could push Jonathan Holder to Triple-A. It’s a good “problem” to have, too many good players. 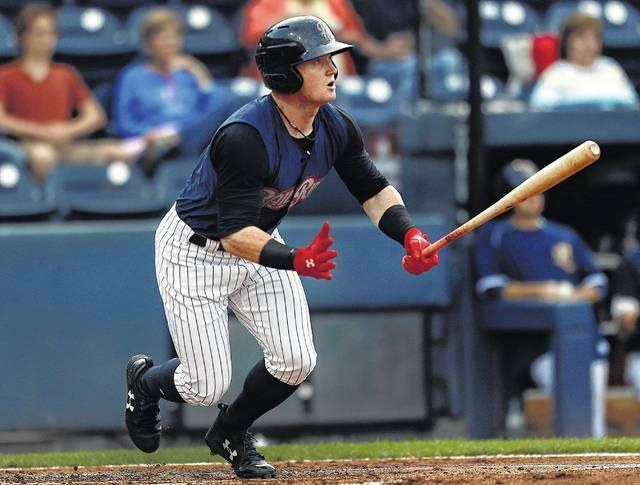 Among the others sitting in Triple-A is outfielder Clint Frazier, who spent a few days with the Yankees last week, and was sent down after going 1-for-2 with a double and two walks in his only big league game. Since returning from his concussion, the 23-year-old Frazier is hitting .339/.393/.679 (202 wRC+) in 14 games with the RailRiders. He went deep on the very first pitch he saw after being sent down the other day. I agree, Frazier should be playing everyday right now. He missed all that time with the concussion — not to mention missing time with an oblique injury last year — and he needs to get at-bats. Those at-bats aren’t available in the big leagues right now, so Triple-A is the best spot for him. Probably half the teams in league wish they had a spare Clint Frazier lying around, able to be plugged right into the MLB roster. The Yankees just don’t have the room right now. We know the Yankees were willing to trade Frazier over the winter. He was reportedly the centerpiece of their Gerrit Cole trade offer, and chances are the same was true with Michael Fulmer and Chris Archer as well. Given their roster construction, it only makes sense to make Frazier available. Among the players the Yankees are actually willing to trade (i.e. not Gleyber Torres), he is the team’s best trade chip, especially now that Justus Sheffield is on the Triple-A disabled list. The Yankees are going to be tied to various starting pitchers in the weeks leading up to the trade deadline — and understandably so, with Masahiro Tanaka and Sonny Gray rocking 5-ish ERAs and Jordan Montgomery hurt — and, chances are, Frazier will again be at the center of trade talks. He is young and essentially still a top prospect — Frazier is a handful of at-bats over the rookie limit and was a consensus top 40 prospect going into last season — and that makes him quite valuable. Aaron Judge & Giancarlo Stanton: Awesome and not going anywhere for a while. Hooray for that. Aaron Hicks: Is he actually good? I think so, but I feel like we’re still waiting for a definitive answer. Besides, Hicks will be a free agent after next season anyway. Brett Gardner: Love the guy, but it’s May 23rd and he’s slugging .299. The .354 OBP is good, but with his 35th birthday not far away, Gardner might be approaching the end of the line. This is the final guaranteed year on his contract too. Jacoby Ellsbury: Not sure he actually exists at this point. He is signed for another two years though, incredibly. Billy McKinney is a nice prospect but not someone you build around. Estevan Florial is too far away to plan around. Aside from Judge and Stanton — and, of course, Stanton has been the designated hitter more often than not this year — the outfield situation is a little up in the air going forward. And Frazier, as a highly regarded young outfielder, can help solidify things. More than solidify, really. He can help the outfield continue to be a strength. Maybe I’m just getting greedy given all the recent success of the farm system. Gary Sanchez came up in 2016 and was awesome. Judge got a full-time spot last year and was awesome. Torres came up this year and has been awesome. We’re all wondering who’s next, and it could be Frazier! He spends this season on the shuttle, then takes over a full-time outfield spot next year, and is the next awesome Baby Bomber. Perfect. That said, the Yankees are done rebuilding transitioning, and they’re ready to win the World Series this year. Putting the team in the best position to win has to be the priority, and the 2018 Yankees could use another starter, and Frazier is the team’s best trade chip. Besides, finding decent corner outfielders isn’t difficult. There’s always a bunch of those dudes in free agency each winter. And occasionally a Bryce Harper too. Frazier is over the concussion and he’s doing well in Triple-A right now, and, in his lone big league game, he made a good impression. He did what he had to do, and that’s make it tough for the Yankees to send him down. As talented and promising as Frazier is, the Yankees can’t make him off-limits in trade talks, but gosh, keeping him and adding another young bat to the lineup in the near future sure sounds appealing too.